Today’s post covers how to make a Buddha Bowl. You know — those vibrant and oh-so-healthy dishes we keep seeing on restaurant menus and Instagram feeds. Those bowls. 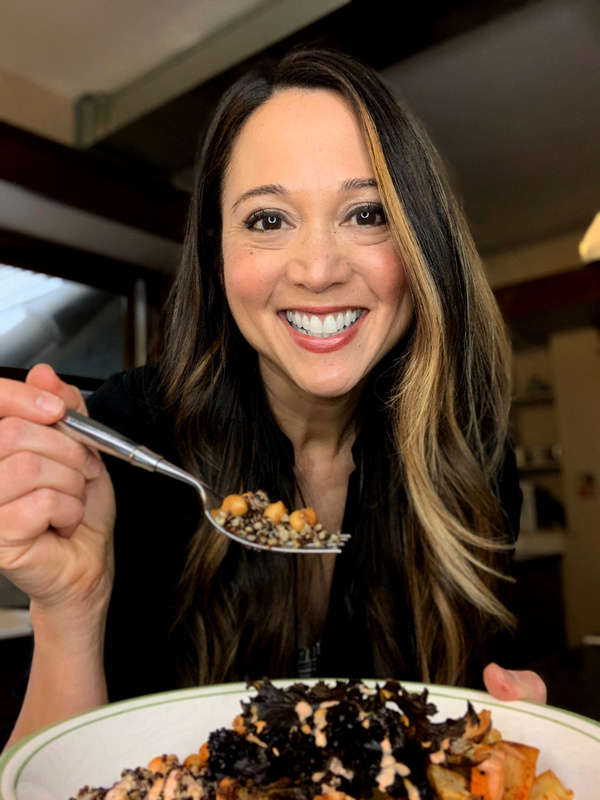 I made Buddha Bowls this week on More Good Day Oregon — you can check out the recipe step-by-step in the video below. So here’s why I love Buddha Bowls — and how you can prepare them more quickly during busy weeknights. For starters, let me just say that it’s officially Little League season — also, lacrosse and track season. And if you have a kiddo playing in any of these spring sports, you know this means you really need to get organized about weeknight dinners. Because if you don’t, you’re going to be eating a lot of take-out while you watch from the bleachers. Or, you’ll be eating cereal on those nights when you and the fam don’t get home from the game until after 8. And no one feels like coming home after a long day (and night) and cooking up a healthy meal. Here’s where the Buddha Bowl comes in: last week, I was trying to wrap up my work day and get to the ballpark to watch my son play. I was feeling all sorts of rushed, and then I thought: I’ll just get take-out and bring it to the game. However, this led to a whole inner debate about where I would get said take-out. Any restaurants on the way to the ballpark didn’t seem healthy enough — especially since I was doing a post-spring break clean-eating thing. Tacos? Nah, too greasy. Plus I’d never get out of there without ordering chips, too. Thai food? Again, more oil than I wanted. Plus, too fussy to eat in the stands. Salad? Too damn cold out for that! So, I looked in my fridge and struck gold. I realized I still had leftovers from the Buddha Bowls I made on Monday night: cooked quinoa, some beans, kale, avocado, and some spicy tahini sauce. All I needed to do was heat everything up. I spent a few minutes warming up the beans on the stovetop, and threw in some taco sauce. In less time than it would have taken me to drive to a restaurant and get take-out, I had a healthy, grab-and-go meal. Plus, no extra side of guilt with that meal. Nothing but tasty, homemade food! Okay, so even if you don’t have kids playing spring sports, you may be navigating some disruptions in your evening routine: late nights at work, deadlines, caregiving, or community commitments. This is where the Buddha Bowl can save you, too. What is a Buddha Bowl anyway? Typically speaking, a Buddha Bowl is a plant-based meal featuring lots of colorful vegetables served up in a deep bowl. 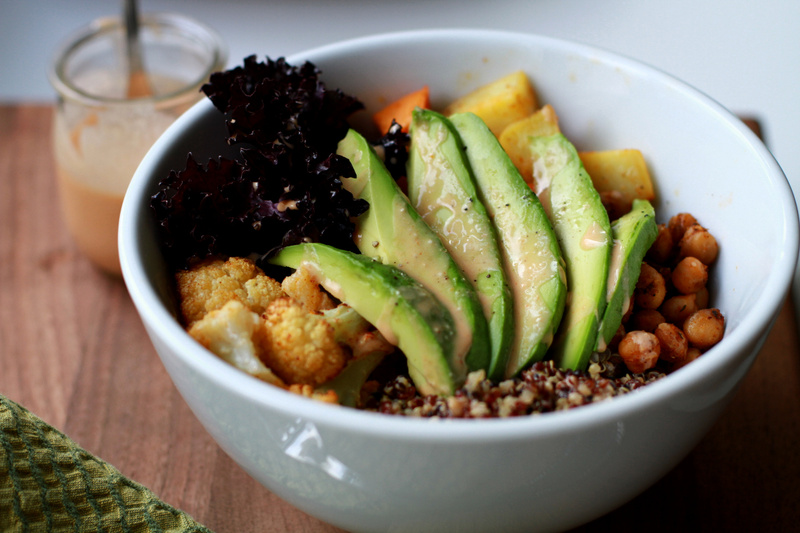 Buddha Bowls usually feature a grain as the base, such as brown rice or quinoa. Or, if you want to make it grain-free, you could use cauliflower rice. Personally, my favorite Buddha Bowls include a grain base, a mix of delicious roasted vegetables, beans, and some steamed greens — or salad greens tossed with dressing. Sometimes, I like some avocado on top. And always: I love me some sauce. Especially my Spicy Buffalo Sauce. But we’ll get to that later. First, let’s talk about how to make the Buddha Bowl… without getting bogged down on the veggie prep. I’m not gonna lie: Buddha Bowls require some prep. There’s a fair amount of rinsing and chopping of vegetables, plus some time to wait around for the quinoa to cook. That delicious Spicy Buffalo Sauce won’t take 5 minutes, but I like doing that on the weekend as well. In short, the more I can prep on the weekend, the more time I can save on those busy weeknights. Cook the quinoa. Let cool, and store in an airtight container in the refrigerator until ready to use. 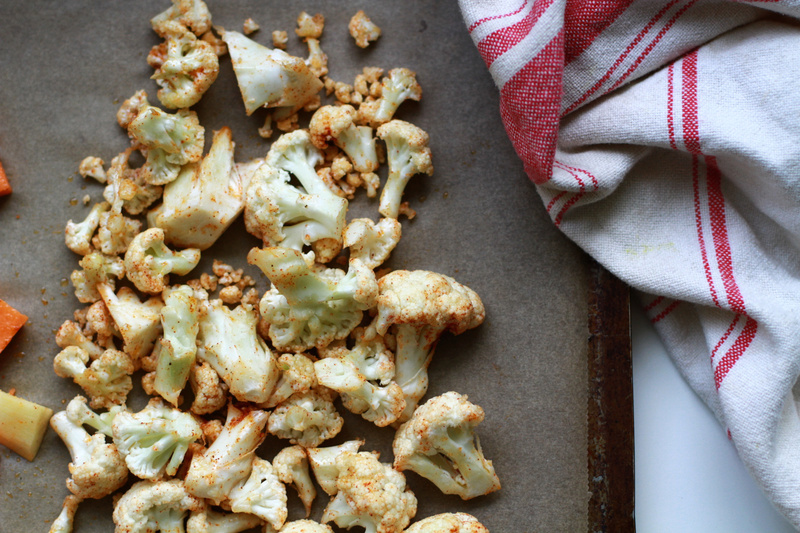 Rinse the cauliflower and separate into florets. Store in an airtight container in the refrigerator until ready to use. Peel and slice the red onion. Cut half of it into wedges, and chop the rest. Rinse and dry the kale. Remove the stems and store the leaves in the fridge until ready to use. 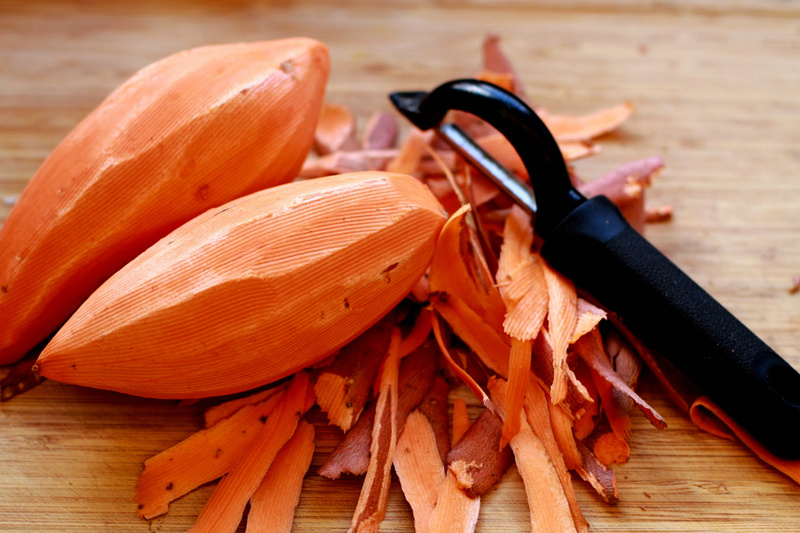 Sweet potatoes: peel and chop. Place into an airtight container and cover with water. Use within a day. Or… roast them on Sunday, and store in the fridge until ready to use. 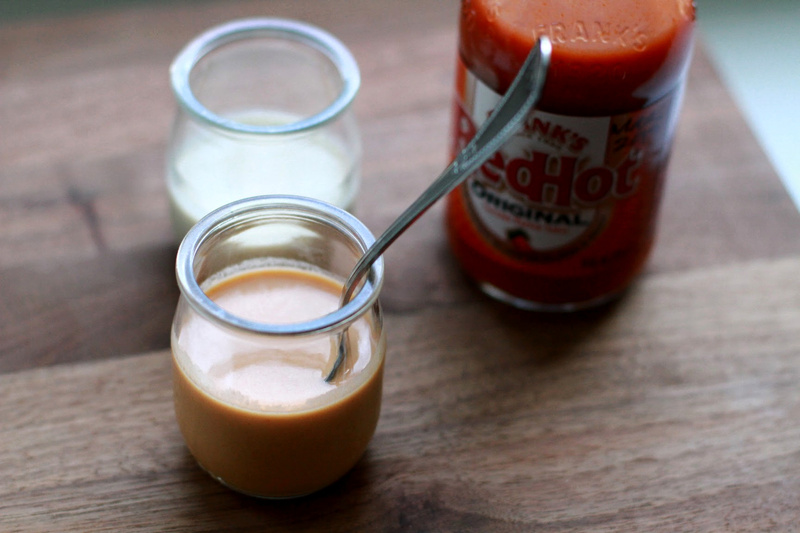 Make the Spicy Buffalo Sauce: 5 minutes tops! Prepping ahead means that you’ll have a delicious meal in less than a half hour during the week. And most of that time will be inactive time — simply waiting for the vegetables to roast and for the (canned) beans to warm up on the stovetop. We’ll cover all of those deets in the actual recipe. Growing up, my family did a brief stint in Buffalo, NY. We were there less than 2 years, but in that short time I was deeply initiated into the practice of eating pepperoni pizza alongside Buffalo wings by the bucketful. Literally. That’s how they were served. To this day, I still crave pepperoni pizza and Buffalo wings. However, I’ve learned how to channel my love for Buffalo sauce into something much, much healthier. Here’s the deal: classic Buffalo sauce involves one particular brand of hot sauce — Frank’s Red Hot — and butter. A lot of butter. Which is then tossed with deep fried chicken wings. Not the best when you’re trying to be healthy. So one day I was making a batch of regular tahini sauce and I thought — hey, I feel like something spicier. What if I just threw some Frank’s Red Hot in there? Well, my friend, the result was magical. At least I think so. And I hope you will, too. The amount of Frank’s Red Hot you add is totally up to you — I like to use about a 50-50 mix of tahini sauce and FRH. But that’s pretty spicy. So if you’re not sure what heat level you like, I’d start with a tablespoon and go from there. To recap, we covered what a Buddha Bowl is. And you now have a meal prep plan for the weekend. Plus we talked about the magical (and healthy) Buffalo Sauce that’s going to take this bowl next-level. Great! Just get the recipe here — or click on the green box below. Also… if you’re wondering about other ways you can use that leftover quinoa, check out my Overnight Quinoa Cups or Quinoa and Black Bean Salad. I hope you enjoy this recipe as much as I do. And I hope that meal prep mini-plan comes in handy. Because when it comes to getting healthy meals on the table, I’m all in on helping you make that happen more quickly and easily. Life is busy, and weekends can be super busy, whether you’re doing errands, having fun, or dedicating your entire weekend to youth sports LOL. However, if you make the time for meal prep, you won’t regret it. Especially when you realize it takes you only 15 minutes to make dinner during the week, instead of the usual 30-60. Here’s even more good news: I created a new freebie for you! 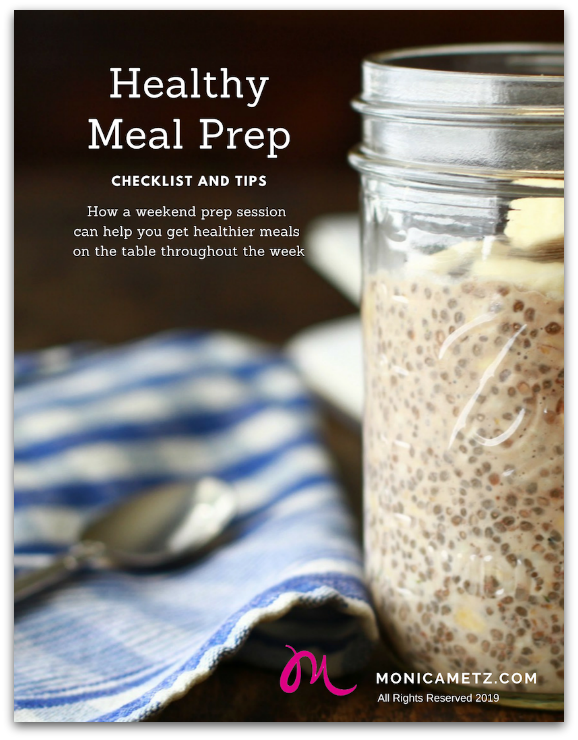 It’s my downloadable and totally printable Healthy Meal Prep Guide. Shopping and meal prep strategies. A blank meal planning template. Downloadable and printable shopping list. Ready to download the guide? Just click here to get your Healthy Meal Prep Guide.